Update: We reached out to Epic Games to see if the double pump technique being reintroduced to Fortnite was intentional. It was not. Best get those kills in while you can. Update: The new Fortnite patch has broken the guided missile. Not only has today’s Fortnite patch reintroduced the double pump exploit, it has also forced Epic Games to remove the guided missile. Update: It seems the latest Fortnite patch has reintroduced the double pump technique. Recently removed, the double pump technique allowed players to switch between two pump shotguns to fire them at a rapid rate, negating reload times. It was unfair, so Epic Games removed it. However, the technique is once again viable after the recent patch. It’s very strange, since the weapon changes seemed built around stopping this kind of thing with any slow-firing weapon. It seems like this may not have been intentional, so I wouldn’t be surprised if it’s taken out again very soon. 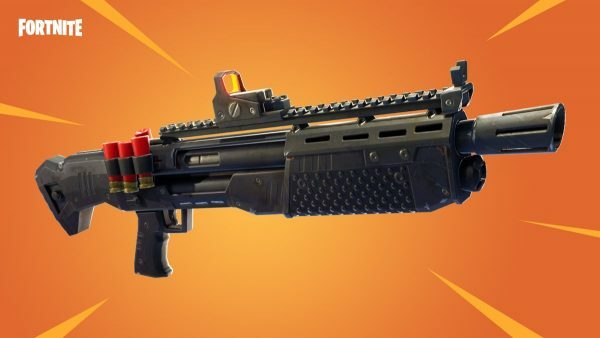 Original post: People who switch between shotguns to up their rate of fire won’t be happy with the new Fortnite patch. Fortnite patch V3.5 just landed, adding a host of changes, new features, and bug fixes to Epic Games’ battle royale powerhouse. As well as introducing the new Port-a-Fort and the Replay System, the patch beamed in a bunch of balance changes. These balance changes will affect slow-firing weapons the most, making weapon switching to negate reload times a less viable tactic. When you switch to another slow-firing weapon now – including the rocket launcher, hand cannon, revolver, tactical shotgun, pump shotgun, heavy shotgun, bolt-action sniper rifle, hunting rifle, and the crossbow – it will take some time for it to be ready to fire. As well as this change, the patch nerfs guided missiles, making them slower to turn by 75% and slowing their overall speed by 15%. You can see the full Fortnite V3.5 patch notes at our dedicated article. If you’re looking to get a head start on tomorrow’s Fortnite Week 8 challenges, they leaked early and you can get prepared by following that link.